Modern mankind look for quick and easy solution to their problems. 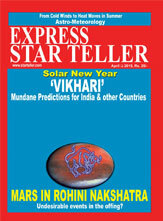 Yantra & tantra can provide such short-cuts. 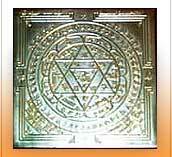 Yantra are mystical diagrams, symbolic representations of the energy patterns of the deities, perceived through the tantric way. 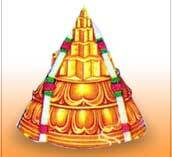 No idol or picture of deity is as powerful as yantra. 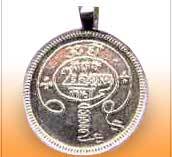 Yantra is not magic, but a path or technique through which one can attain his desires. 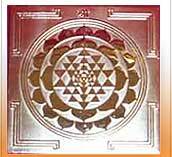 The geometrical forms of the yantra activate the right hemisphere, which is visual and non-verbal. 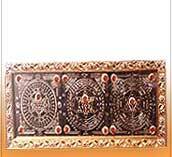 Different types of yantras are devised by our vedic seeers to attain various ends. 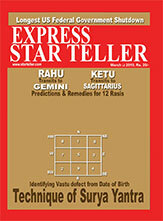 Get it fulfilled through yantra worship! 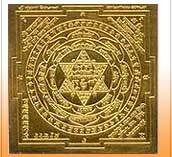 Yantras available for all purposes - Business, Wealth, Health, Knowledge, Pretection, Relationship, Marriage, Grahashanti etc. Get rid of obstacles in any venture Success is yours! Lord Ganesh resides by you, to remove hardships. 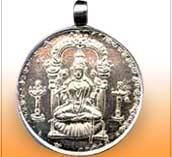 Sarva Jana Mana Dhana Akarshanam -Imporve business, develop wealth, to ward off bad effects of evil eye. 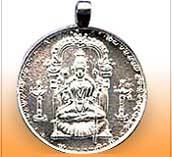 Get relief from Navagraha doshas! Protection against black magic! Restoration of health, wealth and prosperity! . Be blessed with the gift of progeny! Let your family tree grow and enjoy the warmth of a baby. No more affictions from the evil eyes of enemies! 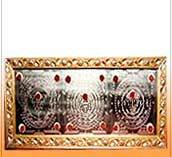 get protection from Lord Sudharsana. Attract wealth and enjoy prosperity in life.